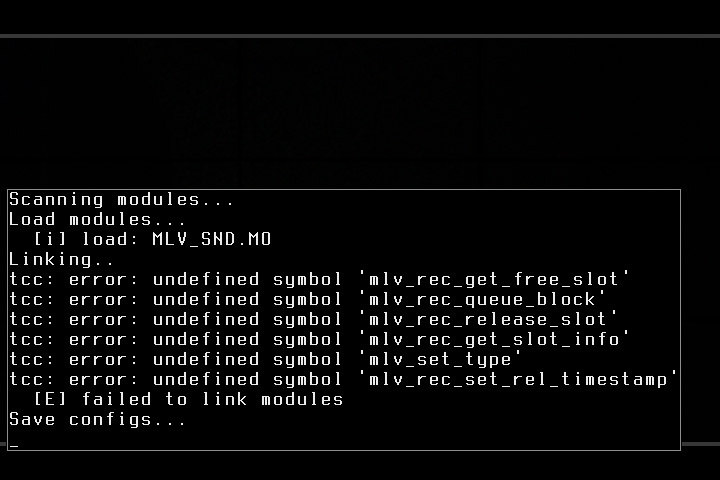 Loading the mlv_snd module without also selecting mlv_rec will crash on startup. Is there a way to force mlv_rec to load when the mlv_snd module is selected? This was tested on the EOS-M but probably affects all the other platforms. Not very easy. One way would be to check dependencies at load time, similar to what's currently done at compile time (e.g. when you compile mlv_snd, it will say that it depends on mlv_rec). The other way would be to encode those dependencies in the module itself, maybe as an info string (similar to Author, for example). Or at least force ML to reject to select it if mlv_rec is not enabled? Say in the modules tab.